Fabric Roman Shades for Elegance and Function – Back Bay Shutter Co. Fabric Roman shades are versatile, elegant and practical. Summer is a great time to ensure that your home isn’t costing too much to cool and that you can enjoy natural light without exposing your furniture or electronic equipment to harsh, direct sunlight. As versatile as shutters, roman shades come in a variety of styles and can be customized to match any aspect of your interior. Whether you are seeking an airy, sheer shade or something that lets you keep a room cool and dark in direct afternoon light, a roman shade is a classy, functional option. The main Roman shade styles are flat, pleated (or hobbled), and tear drop. The Roman shade’s name comes from the days of the ancient Roman Coliseum when retractable shades would be extended during the hottest part of the day to protect spectators from the sun’s rays and were again retracted when they were no longer necessary. Today, Roman shades offer you complete control over the amount of sunlight, and heat, you want to allow into your home. Each style of fabric roman shades has its own feel, but all offer a practical and versatile way to accent and protect any aspect of the room you choose. Flat roman shades are sleek and flat when lowered and can be raised, lowered, and adjusted to let in varying amounts of light. Rich pleated and hobbled shades are made with twice as much fabric as flat shades and retain their pleats when lowered, and teardrop shades are generally raised from either side to produce the characteristic shape. All these shades can be made from any kind of material you choose to match a favored upholstery, wallpaper, comforter or color scheme. And, each of these shades will afford you privacy, as well as greater control over your home’s heat loss and gain and interior light exposure. You will notice the effects of lessening heat gain in the summer and controlling heat loss in the winter when you see your lower utilities bill. You will appreciate the shade’s effects each morning and afternoon as you decide how much of the day’s light and air you want to let into your home. And, many of these shades can be made cordless or could even be motorized and integrated into comprehensive green home systems. Consider fabric roman shades as an elegant, practical solution for any window in your house. View our new photo gallery on Facebook: Shades, Blinds and Drapery. 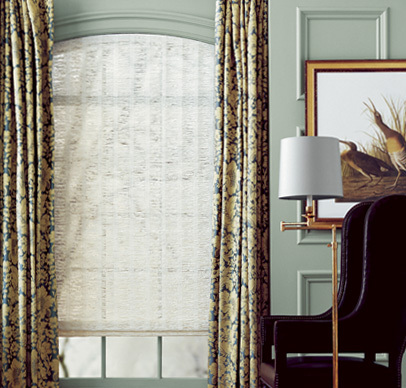 Photo: Conrad Custom Woven Roman Shade, Courtesy of Conrad Shades.